Celtic, British. Iceni. ca. AD 60. Silver unit. "Boudicca type". Date : ca. AD 60. Reference : VA-790-1. Spink British - 434. Sear Greek -181. Size : 12.5 x 13.5 mm. Weight : 1.25 grams. Grade : gVF with a fairly good strike on both sides. Obverse : Male head right. Reverse : Horse running right, with a triangular symbol above, and a diamond shaped symbol below. Van Arsdell attributed this type to the Celtic Queen Boudicca, but the evidence for this is at best tenuous. 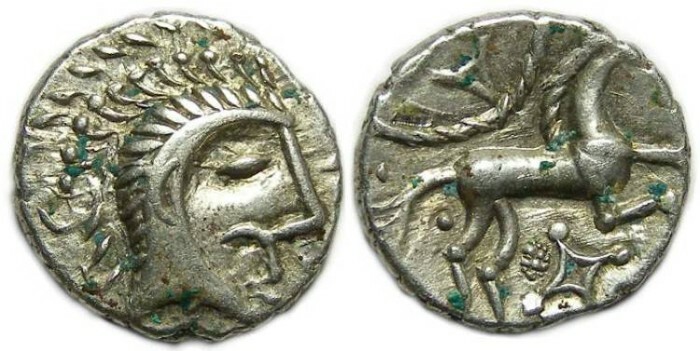 The head on the obverse has a mustache and so we can say for sure it is not a portrait of Boudicca.